the worldwith meaningful energy solutions. their need for power, regardless their location. a leading role in niches of our core markets by 2020.
environment for people who share our passion. Mastervolt is part of Power Products, LLC, which includes various leading brands within its Marine, Mobile & Industrial division. Ancor, BEP, Blue Sea Systems, CZone, Lenco, Marinco, Mastervolt and ProMariner provided innovative electrical solutions as independent companies for decades. Now these leading companies have come together to offer the broadest and most complete electrical product range for every conceivable application. Mastervolt has been a strong, innovation-driven company since its founding in 1991. Product development takes place in three highly sophisticated R&D centres, in Amsterdam (The Netherlands), Auckland (New Zealand) and Wisconsin (USA), where our engineers are continuously searching for new ways to connect breakthrough technology with optimum performance. This capacity to innovate is what truly sets Mastervolt apart. Our added value is to offer products, technologies and systems of the highest quality coupled with superior global service. The passion and commitment of our people make the difference. We are Mastervolt. The Power to be Independent. Top class expertise and support is available throughout the world’s three geographical regions: the Americas, EMEA and APAC. With offices and partners in more than 80 countries, our customers know that wherever in the world they may be, we can deliver precise and fully tailored services without delay. All Mastervolt partners are members of our online professional community where they can apply for training, ask questions, find knowledge and discuss the latest product ideas and improvements. Together they provide an exceptional customer experience at all times. Breakthrough technology is in our DNA and Mastervolt’s highly skilled engineers are responsible for translating tomorrow’s technology into the ultimate performance today. Throughout the company Mastervolt embraces state-of-the-art technology to stay ahead of the curve. 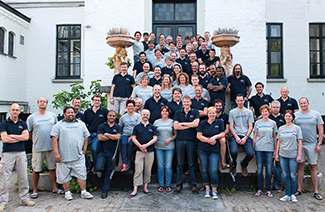 Employees are continuously looking for better ways to design, develop, test and improve new and existing products as well as ship them faster, offer better support and help our customers find the perfect solution. Whatever the industry or application, Mastervolt is power solution focused, offering components that are designed to easily integrate into comprehensive systems. From DC battery power connected by quality wire to power conversion products designed for efficiency, from complete digital switching technologies to monitoring at the touch of a finger, Mastervolt provides the flexibility and customisable systems you desire for your applications. Success is achieved by cooperation. Systems are getting more complex every day, customer demand is increasing and (CAN) communication makes virtually all kinds of integration possible. As well as making these systems available, fully integrated and comprehensible, cooperating with partners allows us to help you get the most from your business opportunities. Together we can deliver a fully integrated system that works well and has all the relevant components. With the world’s leading Marine brands under one roof we can offer a full range of products that fulfil every need. Mastervolt is constantly extending its offering by adding products that enable customers to build complete(r) systems and have these products available via one source. The one-stop-shop principle gives easy access to all our brands, enabling you to increase your share of wallet in any system. A globally oriented customer focus is an important pillar of Mastervolt’s activities. So too is our commitment to responding to new market developments as it determines which markets we serve and how we position our company and products. We remind clients that they are investing in high-quality technology, advanced systems and superior support and service. Mastervolt is always working to expand its global A-brand reputation while using the solid knowledge of our markets and customers gained by research and analysis to lead us forward. Mastervolt is an ISO 9001 certified company.